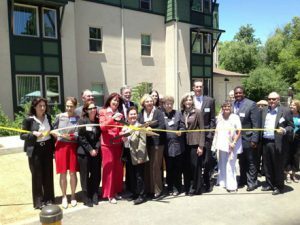 Warner Creek Senior Apartments held it’s Grand Opening Celebration. The project features 60 new affordable rental homes for lower income seniors to “age in place”, a creek-side courtyard, several community spaces for resident activities, a computer learning center, and resident gardens. Sustainable features include bay-friendly landscaping with native plants and high-efficiency irrigation, solar hot water heaters, low-flow shower heads and high-efficiency HVAC pumps. Warner Creek is located near the downtown in close proximity to transit and amenities. Eden Housing is the developer.